These boxes were turned in the month after I got back from a week-long class with Richard Raffan at Craft Supplies in Provo, Utah. 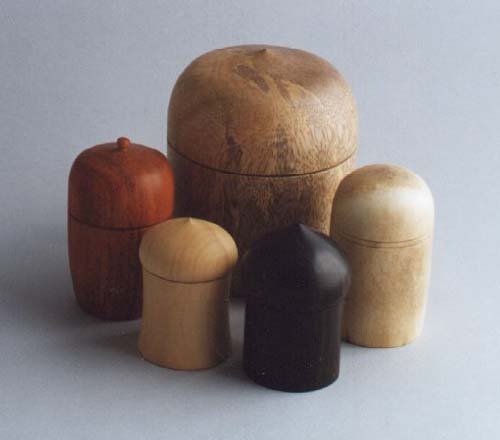 A good part of his class was concerned with lidded boxes, prompted in part by his own preparation for a forthcoming book and video on the subject. I did rather poorly in the class, not being used to working in a group situation with strange tools. I committed myself to putting in a large amount of practice when I got back home in an attempt to redeem myself (and justify the rather steep price of the course). In the month after I got back I turned at least fifty boxes of various sorts. The ones on this page are a representative sampling of those that weren't immediately deemed to be of "firewood" grade. 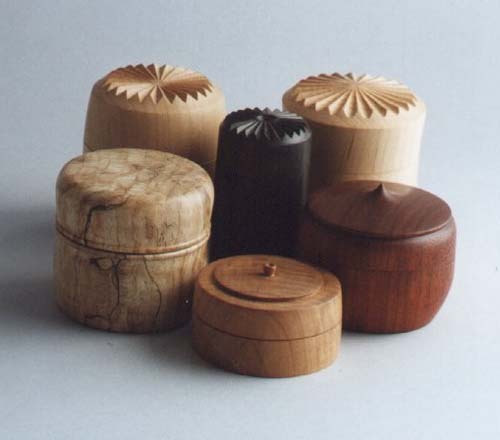 These boxes are made from a variety of materials and in a variety of styles. 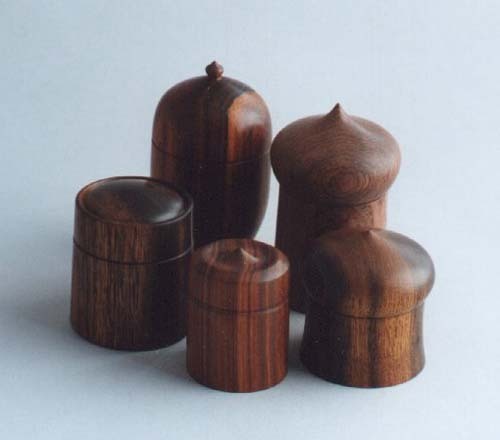 Materials range from yellow cedar and moose antler to exotics like cocobolo and African blackwood. One of the sweetest turning woods among these is something sold as "South American boxwood" which looks and works uncannily like its European namesake which is becoming very hard to find. 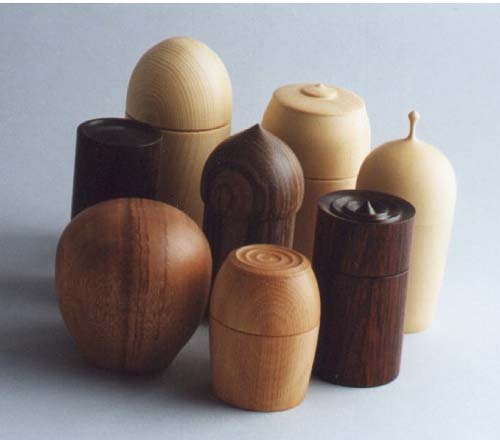 One example in this wood is the pale one with the extreme finial in the last picture. The most perfect box in the bunch is the desert ironwood box at the right-front in the first picture. I carried this box to the AAW symposium in Akron and showed it to Richard Raffan to demonstrate that I had actually learned something in his class. He was complimentary of the design, execution, and workmanship which certainly made made me feel better about showing him the piece. Amazingly, after over six years the top still makes a perfect pneumatic seal with the body: hold it by the base and turn it upside down and it still takes nearly ten seconds for enough air to leak inside to allow the lid to fall. I'm happy to say that I rediscovered these turned boxes after years. I gave them to my mother back when they were made 20+ years back and then lost track of them. 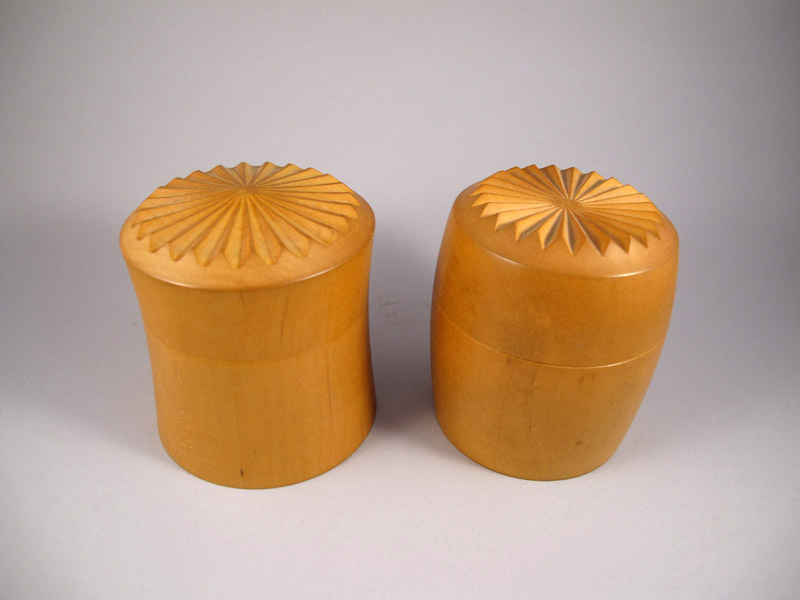 Well, they showed up in a chest in my office along with a bunch of other turnings that I had totally forgotten about. The reason they were so long lost was that the chest sits to the left of my computer workstation and is the repository of a mountain of papers and manuals and whatever so the lid never gets opened. These were always some of my favorites.